Antique Georgian or early Victorian bracelet. Date estimated as circa 1790 - 1850. Measurements: approximately 18cm (7 - 7 1/4 inches) long. Bracelet in the form of square links. 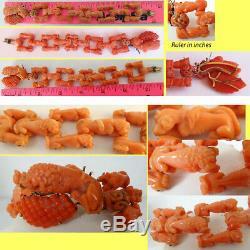 Each part entirely made of coral with gold pins and gold clasp. 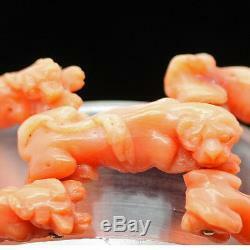 The coral is carved in the form of dogs and lions. Each dog and lion is slightly different to the other. Great detail, from their faces and ears to the curling tails around their well-modelled hind-quarters. There are larger dogs / lions in a line in the center, while the dogs on the outside are slightly smaller. The clasp consists of a long-snouted dog - possibly a Greyhound on one side and a recumbent lionesque animal on the other. 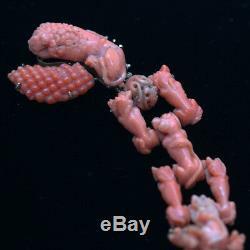 The large lion animal lies curled around a pineapple coral form. 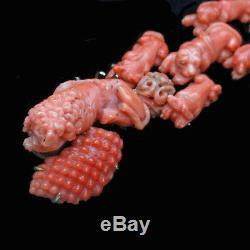 Immediately behind this animal is a carved coral ball, which resembles antique carved Chinese items. The bracelet is utterly unique. Quality of carving is very good. Marks: there are no identifying marks of any sort to be found. We acid tested the gold, which stays for at least 14k. Condition: as is to be expected, there are minor losses to the delicate coral. For example, the largest lionesque animal that forms part of the clasp, has lost a small piece of his tail. Most of the other dogs are in much better condition with very minor losses, commensurate with the age of the bracelet. Wear also commensurate with the age of the bracelet. Please see enlarged'photos for details. Add Me to Your Favorite Sellers. Feel free to ask question. We would appreciate it if you notify us in advance, and explain the reason for the return. Please pack carefully to ensure the item reaches us in the same condition it left here and don't forget to insure and track properly. These charges are the buyers responsibility. 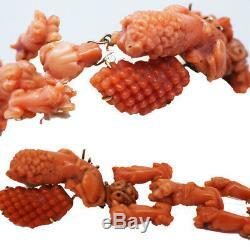 The item "Antique Georgian Bracelet Gold Carved Coral Dog Lion Early Victorian (5278)" is in sale since Thursday, January 17, 2019. This item is in the category "Jewelry & Watches\Vintage & Antique Jewelry\Fine\Georgian, Pre-1837". The seller is "brendaginsberg" and is located in Boca Raton, Florida. This item can be shipped worldwide.